Connect with leaders locally and globally. Rotary is where friends, neighbors, and problem solvers come together to build relationships, share ideas, and take action to make meaningful change. 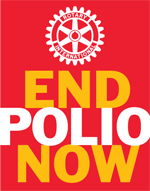 Rotary unites more than a 1.2 million people worldwide. Through the 35,000+ Rotary clubs across the planet, people from all continents and cultures come together to exchange ideas and form friendships and professional connections while making a difference in their backyards and around the world. Each day, our members pour their passion, integrity, and intelligence into completing projects that create lasting impact. We persevere until we deliver real and sustainable solutions. For more than 113 years, we’ve bridged cultures and connected continents to champion peace, fight illiteracy and poverty, promote clean water and sanitation, and fight disease.